As the season hits full swing I thought it might be timely to highlight a particularly relevant aspect of decompression sickness (DCS), that of late presentation, or so-called “diver denial”. There is no doubt that the earlier recompression and hyperbaric oxygen can be administered to a diver with DCS, the better their outcome is. Late recognition and treatment leaves divers more vulnerable to serious long-term consequences. However there is often a substantial gap in the time from the event to getting treatment, and denial plays a major role in this – so much so, that the well-known but curious phenomenon of denial has been termed one of the first symptoms of DCS. It has many contributory facets, and is a topic of concern that we at the London Diving Chamber encounter all too regularly. So what factors are involved, and what can be done to tackle them? The term denial implies an active suppression of a problem, which is too uncomfortable to accept and is therefore rejected, despite what may be overwhelming evidence. There are two broad reasons this occurs in diving: fear and lack of knowledge. Afraid of the treatment – what’s going to happen in the chamber? Afraid of the consequences – will I ever be able to dive again? “Normal profiles and no alarms on the computer mean that a bend is impossible.” Up to 50% of bends occur in divers who have adhered to tables or dived within their computers’ limits, and who have no other obvious provocative factors in their dive profiles. “If ignored or left alone the symptoms will just go away by themselves.” It is possible that mild cases will resolve, but many will persist or deteriorate, as the consequences of bubble damage become apparent. “The symptoms are so mild that they’re not worth treating.” What may appear to be inconsequential at the time could become a much more serious problem if left. Consider the pianist or graphic designer with finger tingling, whose careers are jeopardised as the symptoms become permanent through lack of treatment. “The symptoms must be due to something else.” Typically heavy lifting, cold temperatures, an old injury or another pre-existing diagnosis. Many other conditions can cause similar symptoms to DCS, but anything that comes on soon after diving shouldn’t be blamed on another problem without very good evidence. On this last point it’s worth mentioning that many doctors don’t have any knowledge of diving medicine, and will probably know less about DCS than most divers. And until we develop a good test for DCS (which is about as likely as Monty Python locating the Holy Grail), it’s incumbent on the diver to flag up the possibility and push for diagnosis and treatment. So, this “active” denial may contribute to many cases of DCS, but equally there is often a simple non-recognition of the issue, an unawareness that something is amiss. A major factor in this is the sheer variety of presenting symptoms of DCS. Any body system can be affected, so while it’s relatively easy to spot the joint pains and skin rashes, subtler or unusual (but no more minor) changes are harder to pin down. The consensus is that there are probably a lot of unrecognised bends out there for this very reason, which one might term passive denial. The difficulty of observing illness in oneself when the brain is affected (as it often is in DCS) therefore means it is important for divers to look out for each other. I can recall many cases where a buddy or relative has called with concerns about a diver, who may be behaving oddly but who themselves deny anything is wrong. It’s interesting that similar reasons for delay can be seen in other areas, eg. calling an ambulance if suffering with chest pains. Much research has been done in this particular scenario to understand why this delay occurs, and it’s a sobering fact that despite demonstrating increased knowledge and reduced fear through educational interventions, there has been little improvement. So what can be done to address the situation? Education: Despite the lack of evidence of effect, it makes sense that the more one knows about an illness, the better equipped one is to deal with it. 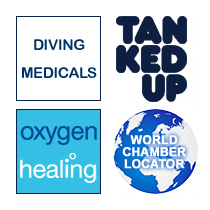 We and other organisations host regular courses and workshops to raise awareness of the problem, talk about ways to dive more safely, blow away DCS myths and demystify the whole chamber experience. Plan of action: One commonly identified barrier is the absence of a plan of action if symptoms occur, so it’s useful to think through and document responses to a suspected diving incident – when to administer oxygen, where the nearest chamber is, who is going with the patient and how are they going to get there. That way, lengthy discussions and subsequent delay to treatment can be avoided. High index of suspicion: Most importantly, it’s vital that the possibility of DCS is considered should anything abnormal occur after a dive. Indeed it’s not too strong to say that any symptom that wasn’t present before the dive should be assumed to be DCS until proven otherwise. Although you might feel that you’re wasting a doctor’s valuable time, I’d much rather speak to and see someone who’s concerned than have them sit at home, worrying about possible DCS on their own. To illustrate some of the pitfalls and unpredictabilities of DCS diagnosis, a few case histories are very instructive. Naturally all identifying details have been changed, but otherwise these are genuine accounts from the LDC archives. In this case it was the wife who contacted us, alarmed at her husband’s unusual behaviour since his diving. When we assessed him later that morning he had developed further sensory disturbances in his forearms, was clearly off-balance and found it difficult to perform simple arithmetic – a great shock to him as he was an accountant. He recovered well with treatment, and tellingly described the previous day as “a fog which I didn’t realise was so dense until it lifted”. Case 2 – This 32 year old female diver was an instructor with over 300 dives to her name. She had finished a weekend of teaching and stayed on an extra day to indulge in a few recreational dives herself. She was using a drysuit and was midway through her menstrual cycle. Shortly after surfacing from an uncomplicated dive to 36 metres for 45 minutes, she began to experience discomfort in her breasts. This worsened rapidly, to a point where she could no longer tolerate her bra. It became apparent that her breasts were also swollen, and tender to the touch. Initially there were no other symptoms. She contacted us about 6 hours after completing the dive, and when we assessed her there was a blotchy red rash across her back. She had no itching, headaches or pains elsewhere. On recompression the relief of pain was immediate, and following treatment her breasts returned to their normal size. Afterwards she recalled a similar although far less severe episode of breast discomfort a year previously, which resolved spontaneously. She was eventually shown to have a patent foramen ovale (PFO), and following its closure has been diving without incident since. Case 3 – A 28 year old male diver was on holiday in Thailand. With a group of friends he went on a 5 day liveaboard in the Andaman Sea. The weather was decidedly rough and he was seasick during the trip out. Each day he did 3 dives, with depths between 25-30 metres for 30-35 minutes apiece, all with 5 minute safety stops. After his second dive on day 4 he found his distance vision was blurred, even with his glasses on, and he could feel a pressure behind his eyes. He put this down to the heat and not drinking enough water. His right shoulder was sore, but as he’d had a last-minute immunisation there he was not unduly worried. All these symptoms seemed to have mostly cleared the next morning. He therefore dived again, on a wreck he had been very keen to see. A moderate swell was present, and he found the current quite strong to fin against. After this dive he developed a severe headache and the visual blurring and shoulder ache returned. He became dizzy and unsteady on his legs, and was sick again. He went to lie down in his cabin, and was woken a few hours later by a friend for dinner. On trying to get up he found his legs would not support him, and he had to cling on to the bunk to stay standing. The next day they returned to port and he went straight to the local hospital, where after various blood tests and scans the doctors diagnosed a “viral inflammation of the nerves”. He was given vitamin B tablets and advised to see a neurologist on his return to the UK. During the flight home his headache was constant and his shoulder pain seemed to intensify. His GP referred him to A&E where he was assessed by an orthopaedic doctor and booked in for physiotherapy as an outpatient. Coincidentally his physio was also a diver, and recognised the constellation of symptoms and their close association with his diving. She contacted us, and when we saw him (now 8 days after his final dive), he was clearly still suffering from DCS, with ongoing balance and gait disturbance, shoulder pain, headaches and lethargy. Due to his delayed presentation, he required several follow-up treatments to achieve full recovery.